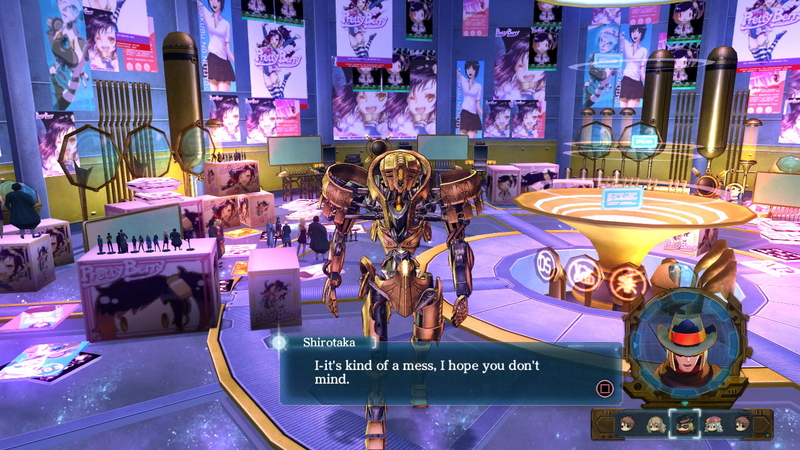 Ar nosurge is set in a universe where civilization has begun to crumble after having been promised tranquility, a never ending, and vast amount of it. The issue? They had to seek it out, but then something arose, an issue that caused their planet to be destroyed, and in turn, they are forced to live upon a spaceship in search of a new home. That was over 2,000 years ago, where we are quick to take up the events where Sharls are attacking and abducting the city of Felion’s residence. This city being protected by a border allows for it to be guarded against the Sharls until one day the defenses begin to falter and outer cities are beginning to be attacked. 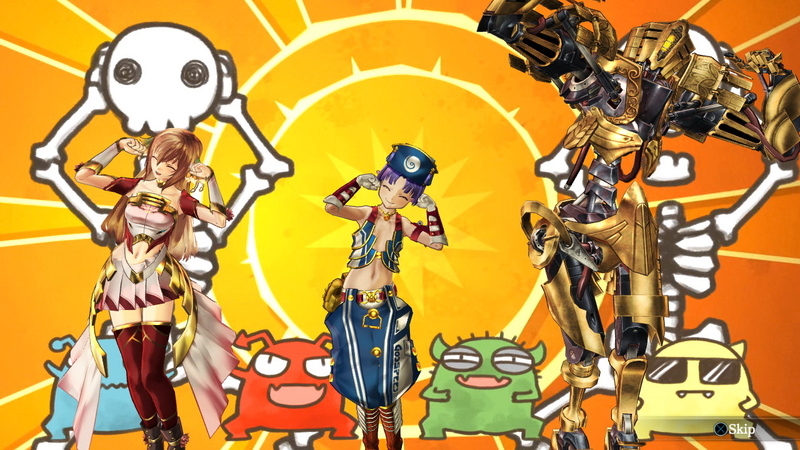 Ar nosurge is one I desperately tried to fall for in the essence of a great and solid story. It is one that made me lift my head up and try to be excited once it made its way across the seas, but the issue was that it didn’t. Most of them I did see just playing mostly as Delta and Cass. This to me was a bit of a problem. What was most of it? In the game Gust tries to get you to fall for the characters so that you can get to like them, part of this is done by doing what’s called a “Dive”, which allows your main character to jump into the mind of the female protagonist; this is known as Genometrics. This is where the game goes from RPG and to a very, at times, drawn out experience as a graphic novel. Within these instances, players will be making decisions, these decisions can unlock new Gems (Genometrica Crystal). These crystals can be used to upgrade both the main character and the sidekick. These crystals work as your stats. The unfortunate part is, you don’t just have to use the “Dive” feature to obtain them, you are quickly informed by your partner (this case Cass) that a purification process must be done as a ritual before this event can take place. What makes this odd? The ceremony is where both characters (within the first thirty minutes or so within the game) strip down to their skimpies and decide to bathe together. This allows them to also “talk” so that players can learn more about the characters and their thoughts and or backgrounds. This is also where you can actually use those gems we mentioned, which can be placed in the arms, legs, torso, abdomen, and well the head. Why is this odd? Because it doesn’t just give you spots to use. You unlock them with trust levels through conversations and or dives. These conversational pieces have to be found too. Think that’s all? Well for the most part it is unless you want to unlock new and more powerful songs. While the main character, Delta and his partner Cass are not taking a bath together or chatting about moments that make you question whether you are watching a romance or a drama, their combat skills put those trust issues the two have seemingly go away. Want to know more about the diving? Lets just put it this way, it’s weird, and it’s one of those moments whether you question if you’d like to continue this game or not. So lets talk about that a moment. Especially because this graphic novel like part is based around these “Dives” and well the points that are required to do it called “Dive Points”. In the ‘Dive’ you do initially you get to meet the main character who works with Delta known as Cass. In this mini-game like graphic novel, Cass is at war with another side of her, the other personality named, guess what? Cass. We also get to see a rather destructive and reportedly end of the world scenario based version of Delta. These two sides are at war due to a misunderstanding, one thinks Delta’s monstrous portrayal was summoned by the other in order to take out the other. Unfortunately, this is not something that seems to be taken lightly by Cass herself. 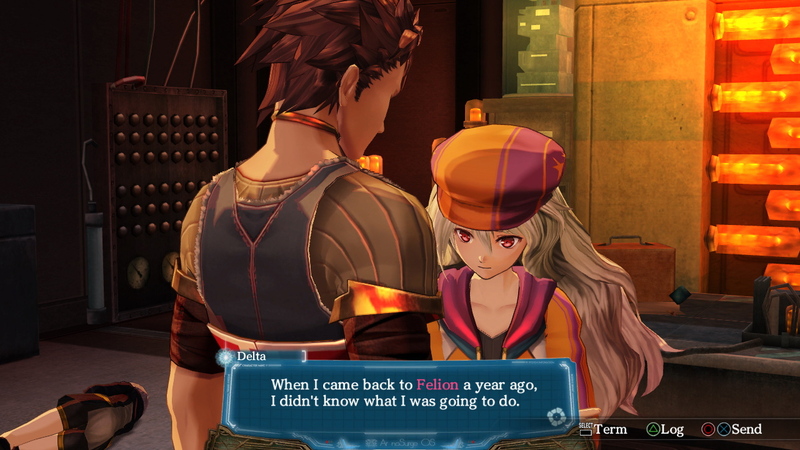 In order to proceed with these conversations, players must choose the proper conversation, which puts Cass in the place to expose her distrust for Delta because of some past events that have occurred. To carry on each of these conversations though, players must have more dive points. If you don’t have enough? Well get ready for the pacing of entering more combat scenarios than before. Who doesn’t enjoy taking out mass waves of Sharl though? I do, which is something that lead to farming for more XP, but also Dive Points to experience the game a tad bit more than previously thought. This also leads to the idea of farming for materials in order to synthesize, which allows players to get more food, and obtainable items through a restaurant that has unfortunately been stolen from Delta by another Plasma member named Nay. This is where the game does take a bit of a relief from humour, something that caused a bit of a laugh to the game since her rather comedic value is definitely noted since she seems to set Delta over the edge. Why is this? His cooking compared to hers is subpar, which lead to her taking over his restaurant and becoming the places vendor. Though as minor as this is it doesn’t take place to one of the more major things to take a peek at: Combat. 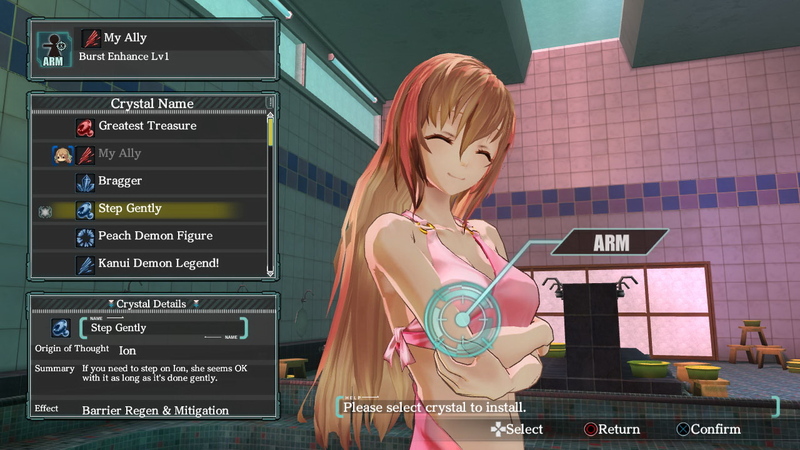 Unlike many traditional RPGs, Ar nosurge follows a bit different of a format, which is where players can enter a combat and leave it at the flick of one ability. This is because of how broken characters tend to be when fighting. Enemies will come in via waves, which each of these waves can easily be dispatched in one turn. Instead, players can build up their burst, use it, and dispatch the entire wave by using a “song magic”, which Cass can use to literally take out enemies by passing the damage through all the waves by having Delta charge up her damage. This includes boss fights, which unfortunately do not feel like boss fights at all. However, if you wish to not use songs, this is not a problem. Luckily the game itself can be done this way as long as the damage you can unleash is high enough, your percentage of damage dealt can go up in insane amounts as it pass through each enemy wave. This is something that many of you will undoubtedly use no matter how long it takes to complete the campaign. Due to its length, this is not a game that will easily be fought through and read through in just a day or two. This game could possibly take weeks due to how much story there is to read through and how much side chatter is put up to the game to have in place. 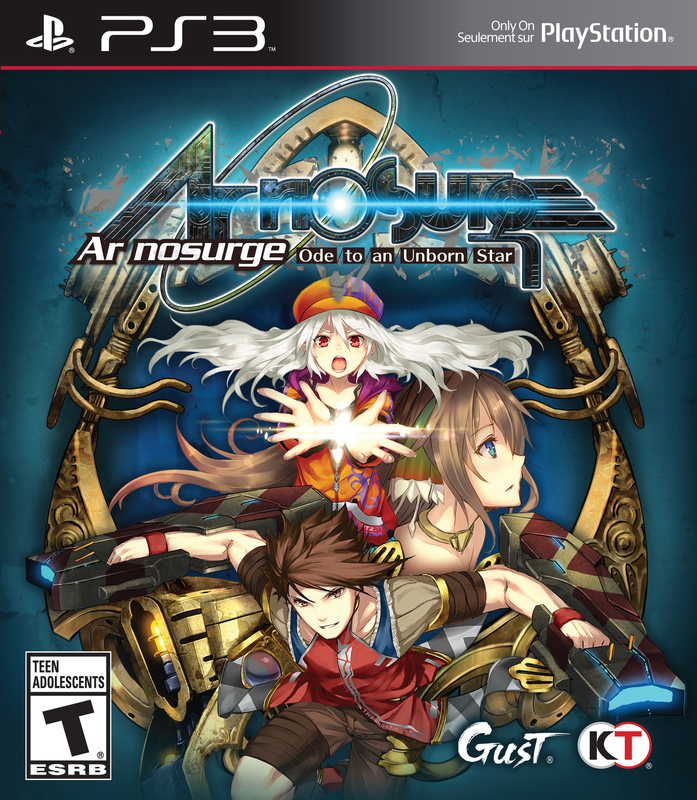 Overall, Ar nosurge: Ode to an Unborn Star is a valiant attempt for Gust to grab more fans by the hands and lead them on, but unlike their other franchises, this is one that is easily forgettable and not highly memorable. It is one that as much as many people have tried, will feel like they are trudging through a pool of tar due to the high school like conversations that take place as well as the drama that tends to dilute the focus on the main campaign for Delta and Cass. However, for those of you who love games that feel more like a drama filled graphic novel than an actual game, this is one that will go straight up your alley and will definitely fill up hundreds of hours of a semi-comedy filled title. For those unfamiliar with the series, this is a direct prequel to Ar Tonelico Qoga: Knell of Ar Ciel, which we do highly recommend. Dustin is our native console gamer, PlayStation and Nintendo reviewer who has an appetite for anything that crosses the boarders from across the big pond. His interest in JRPG’s, MMO’s, Handheld Gaming, and Pizza is insatiable and can’t be softened by even the biggest names in the gaming industry. His elitist attitude gives him direction, want, and a need for the hardest difficulties in games, which is fun to watch, and hilarity at its finest. To follow Dustin, hit him up on Twitter over at@GamingAnomaly, find him on his Google+. Wanna game with him? You can find him on PSN with RaivynLyken. Another review that fails completely at mentioning the dual viewpoints, as Ion and Earthes are never mentioned; the quality of the music, the role of the player in the storyline, and the fact that the game can be genuinely difficult in Hard and Veteran. Plus, dismissing several important parts as mere “high-school drama” shows the reviewer just began mashing through the texts at some point instead of bothering to read through them. And plus, it isn’t a direct prequel to Ar tonelico Qoga: it’s a distant prequel to Ar tonelico: Melody of Elemia, and a direct sequel to the Vita game Ciel nosurge, which is actually key to understanding what happens in the game. We actually spent quite a bit of time with the title, roughly twenty hours in. The games points that were noted based on an overall glimpse of Ar No surge. While I absolutely loved Ar Tonelico I do feel that there were more aspects that could have been touched upon. 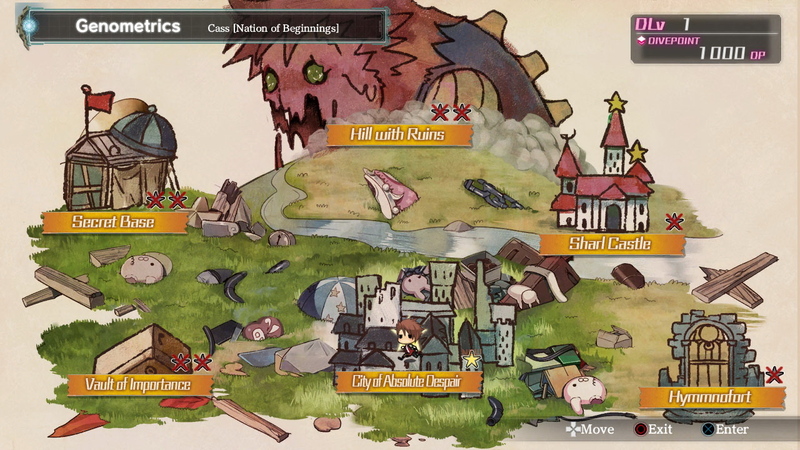 It was stated that the title felt like a high-school drama are due to the games moments within the cleansing pools, the idle banter when exploring zones, but also some of the nonsense that took place regarding Nay. We do intend on revisiting it in the future as a re-review.